A private photo album of an official World War I cameraman is something extremely rare. So we were surprised to find such a collection recently on Niles Laughner's Military Antiques weblog. These pictures all come from U.S. Signal Corps photographer Wesley Strait's personal estate. Strait was born in Brooklyn, New York, in 1893. At an early age Wesley shared an interest in photography with his twin brother Jess and both young men soon started working as a press photographer for the New York newspapers. When the motion picture industry expanded across the country Wesley also learned how to handle a movie camera and in 1917 he became a cinematographer for the Vitagraph Company which was then operating in Flatbush, Brooklyn. 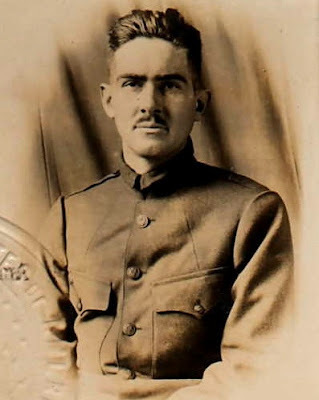 When the U.S. entered World War I both Strait brothers joined the U.S. Signal Corps which has been assigned to cover the American theater of war in France. 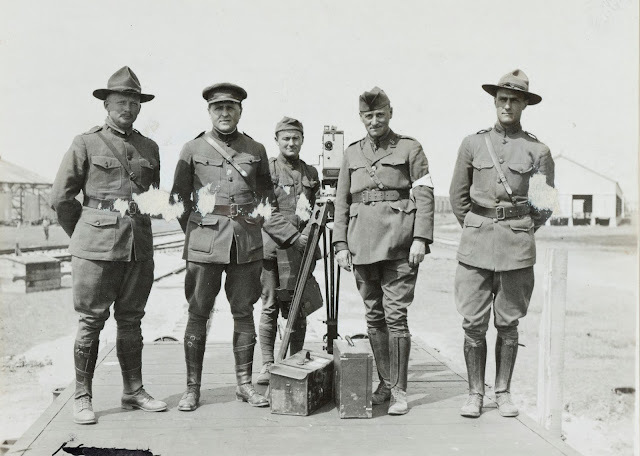 In a production file of a Signal Corps film, now at the National Archives in Washington, D.C., we recently found a reference to Wesley Strait, mentioning his work at the Filing Department of the Signal Corps photographic laboratory near Paris during World War I. This department was responsible for filing all film and preparing all original negatives for shipment to the United States. His album, in the permanent collection, is huge. Somehow, Strait managed to get into most of the images, as in the ambulance shot ... he is on the stretcher! He had lots of girlfriends, some of which are shown here. He witnessed the wonders that most Americans then (and perhaps now) had only read about ... the Moulin Rouge for instance. He colored many of the shots, an example here has him with North African French troops ... and that's him with the movie camera. The image with his mom (family resemblence ...!!) and either a sister or girlfriend and the family cat is a lovely shot taken before he left for Europe. I suppose no one really remembers him, but his photos, and his sense of humor in some of them, survives him in this album. After his return to America Wesley Strait worked for the New York World, the World-Telegram and the Daily Mirror. He was the official photographer of the New York World's Fair (1939) and a member of the Press Photographers Association of New York. After his work for the World's Fair, he did freelance photography up to 1942 when he was employed by the Grumman Aircraft Engineering Corporation, a war industry. On December 16, 1942, Wesley Strait died unexpectedly at the age of 49 as a result of a stroke at Adelphi Hospital in Brooklyn, New York City. We have uploaded a selection of pictures from his personal album on our photo channel. In 2014, the same team that collaborated on the renowned World War II series Apocalypse produced a similar documentary series on the Great War. 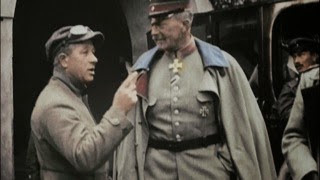 As with the previous production, the new series has some remarkable colored footage including scenes from Wilbur H. Durborough's film On the Firing Line with the Germans (1915). As described in a previous weblog, Durborough's film has been restored by the Library of Congress and the movie was uploaded on the internet in November 2016. After almost one hundred years an original World War I film is back on the screen. To coincide with this online release the authors prepared an extended story on the making of Durborough's remarkable war film. Based on our previous book American Cinematographers in the Great War, we added new information that was found in early 2016 in the German archives as well as in the American and Dutch newspapers. If you are interested to see Durborough in color here is a scene from Apocalypse World War I, episode 2, showing his film work at the Eastern Front in 1915. The National Archives in Washington, D.C. once again revealed an interesting collection on World War I. An excellent series of pictures showing American war correspondents at the front was found recently by the authors. Adrian C. Duff (U.S. Signal Corps) with his movie camera camera, together with American reporters. St. Nazaire, France, 2 July 1918. From the National Archives in Washington, D.C. The photographs are from Record Group 165 "Unofficial Collection of World War I Photographs". This group is part of the files of the Historical Branch, War Plans Division, War Department General Staff, and was assembled by the Committee on Public Information (CPI), America's propaganda agency during the First World War. In these pictures are some correspondents that we mentioned in our book American Cinematographers in the Great War. Most of the journalists were newspaper reporters, such as Herbert Corey who was in Germany at the beginning of 1915 and after the American entry into World War I went to France. We also found a wonderful series of photographs showing Irvin S. Cobb who covered the Great War for the Saturday Evening Post. Cobb wrote a book about his experiences, published in 1915, titled Paths Of Glory. After a second visit to France with the American Expeditionary Force he succesfully publicized the achievements of the unit known as the "Harlem Hellfighters". One of the pictures that we found shows Cobb with General Doyen (U.S. Marine Corps) in France. As far as cameramen are concerned, we found two pictures in these files, showing Albert K. Dawson who accompanied the German and the Austrian army during the First World War for the American Correspondent Film Company. The picture showing him before his tent during the siege of Przemyśl in May 1915 is without a doubt the best image reproduction we have ever seen. 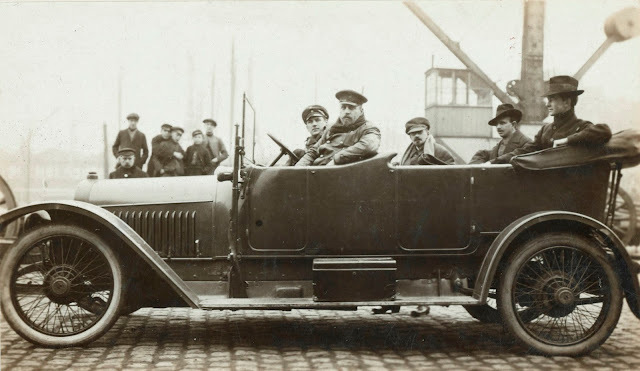 There is another photograph showing Dawson in a German military car when he visited Belgium in January 1915. Albert K. Dawson (right) in military car at Antwerp, January 1915. 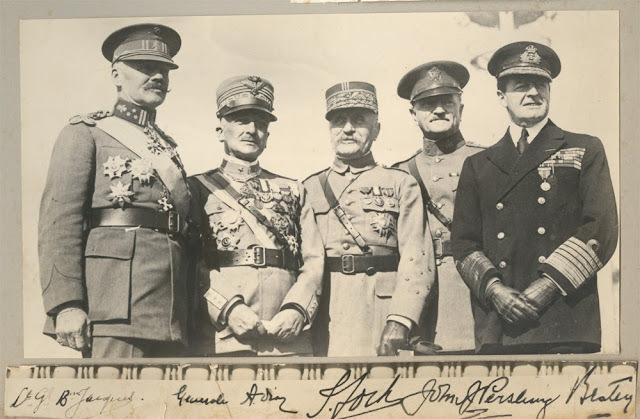 Third from left: Josef Schumacher of the Zentralstelle für Auslandsdienst (ZfA). Photo © Brown & Dawson. From the collection of the National Archives. Download link to original high res photograph here. This picture is also in our book American Cinematographers in the Great War, and the reproduction has Dawson's personal handwritten comments on his trip through Belgium. The high res scanned image from the collection of the National Archives for the first time reveals the identity of the man in the middle: Josef Schumacher, who was in charge of pictorial publicity for the Zentralstelle für Auslandsdienst, Germany's foreign propaganda agency during World War I. This once again confirms the story we have described in more detail in our previous publications about the use of Dawson's pictures by the Germans for propaganda purposes. 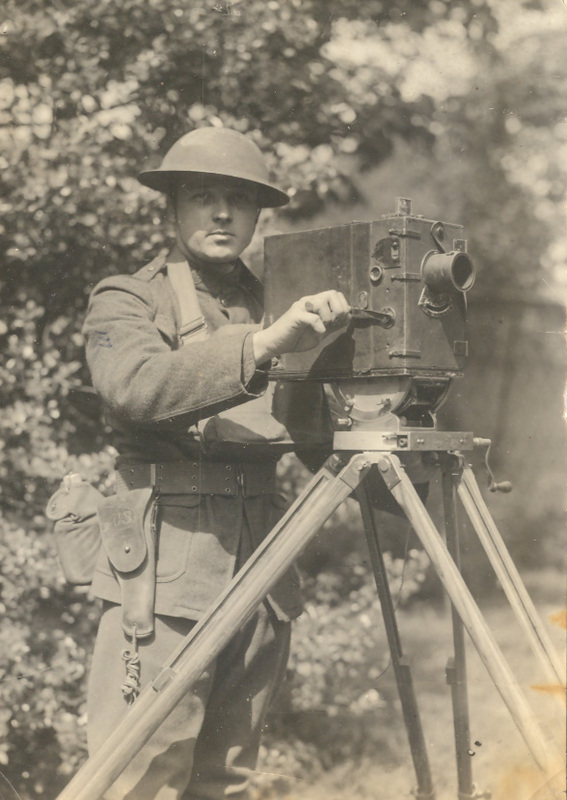 Finally the picture file at the National Archives also shows cameraman Adrian C. Duff who was a news photographer and joined the U.S. Signal Corps in 1917. Duff made national headlines in 1912 when he got in a plane with aviator Frank T. Coffyn and for the first time in history photographed New York City from above. 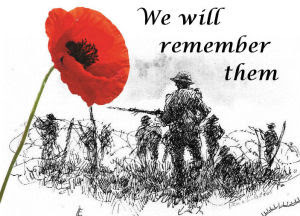 There is more on Duff and his World War I pictures in this previous weblog. We uploaded this collection to our photo channel on Flickr, and you are free to download these photographs here. Watch silent movies with new musical scores by renowned silent film accompanist Ben Model. Some of these are from DVD releases (uploaded with permission) and some are rare one-of-a-kind 16mm prints of lost films in Ben Model's collection. To give you a feeling what it must have been like to watch a newsreel during World War I here is Ben Model's presentation of a 1918 newsreel showing U.S. troop on parade in Paris on the Fourth of July. The original footage comes from a contemporary British Gaumont newsreel which was issued for home use after the Great War on 16 mm format around 1948. American troops as well as Red Cross nurses are seen parading along the Champs Elysee and the Place de la Concorde. The film segment ends with footage of President Poincare and General Foch. The musical score is by Ben Model © 2012. You can watch all of Ben Model's silent film presentations on his YouTube channel here. Best remembered as co-director of the 1933 classic King Kong, Ernest B. Schoedsack was a pioneering documentary film maker who was one of the first cameramen to take his movie camera into the Thai jungle and covered the nomadic tribes of Iran. His name on the Hollywood Walk of Fame testifies to his extraordinary skills as a film director, producer and cinematographer. Schoedsack's life and career has all the makings of an adventure story. Born in Council Bluffs, Iowa, on June 8, 1893, Schoedsack ran away from home at the age of twelve and headed for California. By the time he was seventeen he was working as a cameraman for the Mack Sennett studio. During World War I Schoedsack shot numerous comedies for Mack Sennett, and he also was listed as cinematographer for the Mabel Normand Film Company. 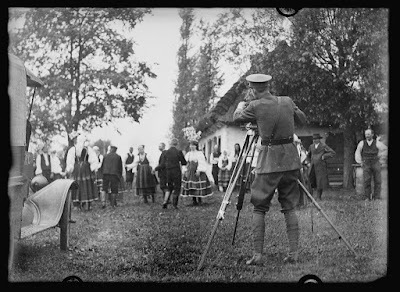 When in 1917 America declared war on Germany, Schoedsack enlisted in the Photographic Division of the Signal Corps and was sent to France. Most of Schoedsack's biographies only have a few words on his film work during the First World War. Apart from Kevin Brownlow's excellent research - he interviewed Schoedsack on his World War I experiences - not much is known about this extraordinary episode in his film career. As is shown in his World War I Registration Card, Schoedsack was very much interested in the military. From 1915 he was a non-commissioned officer for the National Coast Guard in California. Initially he expected to be sent to the U.S. Coast Guard but there simply wasn't any call for anti-aircraft. When he learned about the new Signal Corps Photographic Division, which was set up to cover the Great War, Schoedsack soon applied for a position. After a brief stint as an instructor at the Columbia School of Military Cinematography Schoedsack was sent to France. "We finally reached Paris, and were taken off to Vincennes. The Signal Corps occupied the Pathé chateau, and they had a laboratory and cutting rooms on the fourth floor of the Pathé factory. The other floors were being used as a gas mask factory. The gentleman in command was a very nice old bloke. He had been an optometrist up in Oakland. He was a reservist in the National Guard, and they had to give him a job someplace. So, optometrist pertaining to lenses, lenses to photography - voila! The only officer remotely connected to the picture business was Al Kaufman. The other three executive officers were characters they had no use for anywhere else. The general idea was to stay in Paris and have fun." "I complained a lot, and agitated a lot, and finally they said, 'You want to go the front? All right, you can go to the front. A cameraman (Harris Thorpe) pulled out of the combat area and I got my chance. I wanted a light camera. Oh, no. They gave me this damn great Bell and Howell and this great trunk. It weighed a hundred pounds. They needed the light cameras, the Debries, down in Paris, I guess, where all the action was. I had no directive, no passes, no nothing. They didn't even give me a gas mask or a helmet, although I did get a .45 and some ammunition. I got a truck down the combat zone, but an MP stopped me because I had no gas mask or helmet. There were some fresh graves by the side of the road, and one of them had a gas mask and a helmet. The helmet was bashed in on one side, and I remember the name inside was Kelly. Anyway, that got me into the combat zone. There was hardly any activity in the daytime. All the barraging and banging around was at night. Photographically, there was very little you could do." Cameraman with the 77th Division, A.E.F. In his interview with Kevin Brownlow Schoedsack did not mention when he was sent to the front but thanks to research by Harry B. Kidd we are now able to reconstruct parts of his film work during World War I and identify some of the movie scenes that he shot while he was in France. On August 25, 1918, Schoedsack's picture was taken in the destroyed village of Mareuil-en-Dôle. This was in the Aisne region, near Château-Thierry. 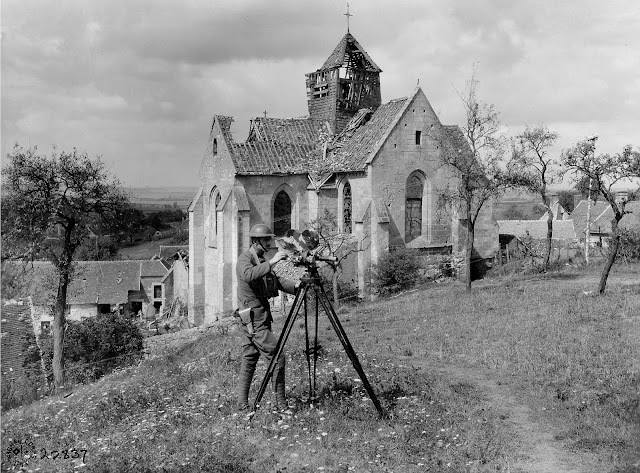 The picture shows Schoedsack cranking a Bell & Howell movie camera among the ruins of a church. The captions mentions he was a private soldier with the Photo Unit of the 77th Division of the American Expeditonary Force (A.E.F.). Bahman Maghsoudlou in his book on the making of Schoedsack's film Grass (1925) mentions that on his arrival in France Schoedsack was placed at the head of the Photographic Unit of the 77th Division. This would have made him a Lieutenant 2nd Class, commanding a team of still and movie photographers. Schoedsack indeed stayed with the 77th Division until the end of the First World War, and he must have recorded many film scenes for this American Division that are now in the National Archives in Washington, D.C., notably "Occupation of the Baccarat Sector" (111-H-1300), "Oise-Aisne Operations" (111-H-1358) and "Meuse-Argonne Offensive" (111-H-1417). But the contemporary records do not produce any evidence that Schoedsack was commissioned as a photographic officer. For example on October 23, 1918, Schoedsack went into a plane and filmed the German lines above the Argonne frontline sector that had just been captured from the enemy. Thanks to research by Harry B. Kidd, the production records have been retrieved. These documents show Schoedsack was a private soldier when recording these scenes just a couple of weeks before the end of World War I.
Schoedsack was discharged from the American Expeditionary Force in February 1919, but he did not immediately go back to the United States. After the Armistice he joined the American Red Cross and worked on behalf of Polish war relief, helping thousand of Poles escape the Russian occupied territories. Schoedsack at this time also met his lifelong friend and fellow film maker, Merian C. Cooper who, like Schoedsack, was a fervent anti-Bolshevik and also an aspiring film director. Together they filmed the war between Poland and Russia. Shortly afterwards, Schoedsack also covered the war between Greece and Turkey for the American newsreels. During World War II Schoedsack served in the Air Force. While testing equipment in a tank at Edwards Air Force Base, a shell exploded nearby and his head hit the bottom of the tank turret, detaching the eye retina. Subsequent operations couldn't repair the damage and Schoedsack was virtually blind for the last 35 years of his life. 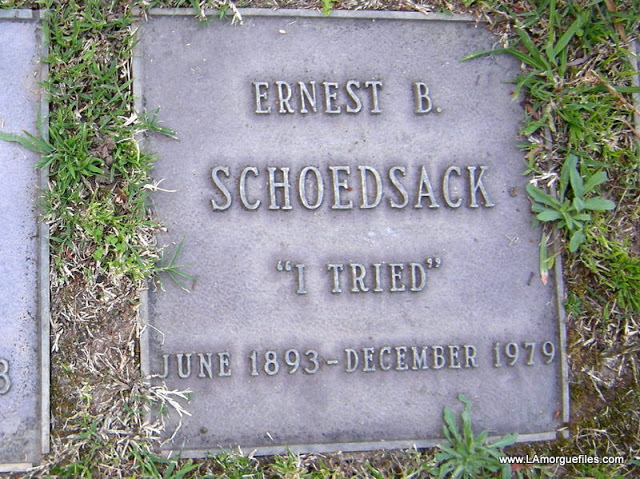 Ernest Beaumont Schoedsack died on December 23, 1979. He was buried at Westwood Village Memorial Park Cemetery in Los Angeles.